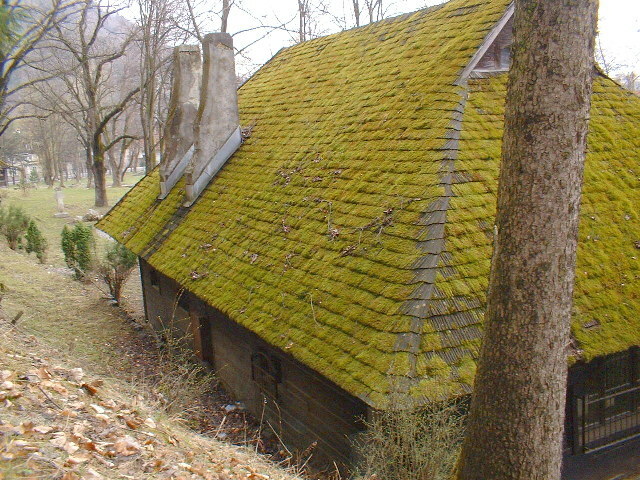 Lichen –that green stuff you call moss growing on your roof is a fungus. Everyone knows that treating fungus is only done with some type of medication; it just doesn’t go away on its own. What you take for your body is real similar to what needs to happen for cleaning roofs. Using a pressure washer on your roof is tantamount to scratching an infection and spreading it around. Without treatment these spores are now where they started from to covering your entire roof. Water propels these spores and sends them streaming and breeding along your roof line without the proper treatment after a cleaning you’re left with a bigger problem then what you started with. An effective chemical to treat any type of moss is sodium hypochlorite at a high percentage. You can’t just go in and buy bleach at the store and spread it around as the percentage of bleach on store shelves is too low in quantity per gallon and too expensive on your pocket-book to actually do its job. On average a roof needs 35-40 gallons of roof cleaning mixture to cover and kill moss on your roof. The effect is minimal when sodium hypochlorite isn’t given an effective herbicide (penicillin for plants) to help it last longer and kill those spores that are left, from returning. When you decide to hire your contractor, the type of chemical he uses will give you a good idea on when you’ll have to hire him again. MOSSBEWARE and MOSSOUT are the 2 biggest retail moss killers out there. Sure they do their job but the effects only last for about 60 days before the stuff is back. On average our mixture lasts 2-3 years. Safety Monitors: One man is constantly looking out for his partner from the ground, while another performs the actual work. Safety Straps in multiple locations: based on our experience a home in Bellevue requires 3 straps or more. This can drive up the cost on a roof cleaning in Bellevue, by up to $150 dollars as compared to other areas. The volume of cedar roofs is much higher. A big percent of our jobs in the area are cedar shake cleanings. Cedar shake cleanings require safety precautions not found on asphalt shingles. The residents of Bellevue and the eastside take great care of their homes and are savvy when it comes to making decisions on the right contractors to hire. Based on our professionalism and track record for completing jobs on time and on budget we have received an enormous amount of referrals from the area. We hope to continue to be able to serve the residents of bellevue and look forward to many more years of visting this great city and its wonderful residents. Seattle roofs need cleaning for the simple fact that our atmosphere dictates it. Moss grows in moist conditions where sunlight is indirect or infrequent. On average Seattle roofs need cleaning 2x a year. PWNG has developed and worked with a chemical mix that delivers a fatal blow to moss on asphalt shingles that lasts double the amount of most of our competitors. Take a look around you and you will see that Seattle roofs need cleaning. On a recent day on one of my rare days off I looked over a hill and saw a sea of green roofs, overlooking Lake Washington. Left unchecked, these roofs will need replacement, in a very short amount of time. The cost for these replacements might be a good thing for our economy since Seattle replaces more roofs per year then just about every big city, but if I had the choice Id rather spend my money on something I want rather than on something I was forced to buy! Make no mistake the cost of a seattle roof that needs cleaning is far less then a seattle roof that needs replacement. About 15k dollars less on average! The amount of cleaning depends on your area, but really though King county is ripe for algae growth we are in the national danger zone for moss growth. Whether it direct sunlight or in shade. PWNG offers up to a 3 year warranty on roof cleaning. Not only is that unheard of in our area, but we are the only company locally that is a member to the RCIA, which sets a standard for roof cleaning. Always remember that when asking for a price quote from a contractor to ask them whether they will pressure wash your roof. Read some of our previous posts to find out why you should never pressure wash a roof. Granules, the sand like element that is keeping the rain from destroying your home by way of the roof shingle. Granules are also the reason you should never pressure wash your roof. These delicate granules are held to your roof shingle, layer upon layer by a form of glue. A simple walk on your roof removes some granules, just imagine the damage a pressure washer does to it. A.R.M.A [American Roofing Manufacturers Association] represents a majority of roofing manufacturers in North America. Their primary concern has been to find common ground on asphalt shingle manufacturing and the process of maintenance. The only long-lasting way to combat algae is to have AR [algae resistant shingles] installed. So what does this tell us about combating moss in Seattle? Kill the spores, kill the moss, in order for this flowerless plant to reproduce it must reproduce through spores. As sad as it might sound there is only 1 way to kill moss. Using an herbicide that kills it and its spores . As members of the RCIA, we have developed a complete and time-tested way of eliminating moss in Seattle. Keep following us and learn those methods.